Digital marketing for doctors can be tricky. This is particularly because medical professionals need to go the extra mile to build a sense of trust and assurance with potential patients in the online space. Whether you are a practitioner or looking for ways to improve the visibility of your clinic, it is important to incorporate a digital-first marketing strategy to widen your clientele. Here are a few digital marketing tips for doctors to stay relevant and patient-centric. The most important platform that serves as the first point of contact between you and a potential patient is your website or landing page. The user experience provided by your website will lay the foundation for the first impression created on visitors. To provide the best user experience, it is important to create a website or landing page that is extremely navigable and user-friendly. Furthermore, you must ensure it contains all the adequate information patients look for while searching for medical help. Important details such as doctors profile, consultation timings, health departments, courses of treatment and procedure to fix an appointment are extremely vital. Additionally, you can implement AMP-enabled pages for lightning-fast loading speed, to ensure visitors stay on your website and do not bounce off. 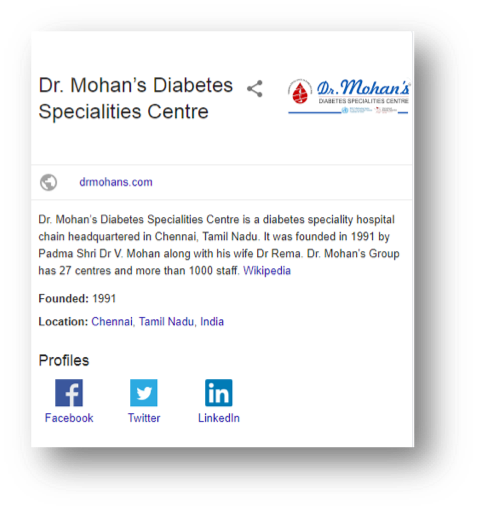 Featured below is a website developed for Dr Mohan’s Diabetes Centre – the nation’s leading diabetes clinic. From services to locations of clinics, the homepage covers all the aspects that patients are looking for, making it highly efficient and discoverable. To add to that, featured below is a video on how AMP landing pages produced 33% lower CPL for India Home Health Care – a leading healthcare provider. When IHHC approached us to generate high-quality leads at lower cost-per-lead (CPL), we incorporated AMP-enabled landing pages that load faster, are mobile responsive and look great on both desktop and mobile. Within three months of launching, the total conversions increased by 20% with a 33% reduction in CPL. After creating a user-friendly website, the next area of focus is to build strong informational blogs that resonant with your medical practice. According to statistics, there are about 3.5 million medical searches on Google on a day-to-day basis. As a first step, you need to understand those subjects which are being constantly searched on the Internet. From informational content on symptoms and treatment options and FAQs to home remedies and simple tricks, you can use your blog as a platform to give simple advice to your customers. Additionally, there is no better place than blogs to feature the success stories of your patients. Customer testimonials can greatly influence your website traffic and readership. To stay relevant, it is important to plan an effective content strategy by identifying the important dates and months in the world of health. Email marketing is yet another effective approach when it comes to digital marketing for doctors. Resourceful emailers help practitioners connect with their audience at a more personal level. Your patients will find it extremely useful as the information is right there in the inbox before even they plan to search for it. Featured below is the blog page of Neuberg Diagnostics. Neuberg Diagnostics addresses a diverse range of healthcare concerns for its customers through an innovative content strategy. Their blogs are relevant, informative and highly engaging. Recent statistics show that there are 5 million videos that are watched on YouTube every single day. Engaging videos generate 1200% more shares than images and texts combined. Videos are a great digital marketing strategy for building credibility and authenticity for your brand. There is nothing more engaging than watching a medical professional provide deep insights on a particular disease or treatment. It helps your patients feel at ease and assures them that they are in the hands of an experienced practitioner. Videos are also an appropriate place to feature your customer testimonials. The greatest advantage of videos is its ability to invoke a wide range of emotions like hope, passion and courage which pushes them further down the marketing funnel. For example, here is a video created by Dr. Mohan’s on the concept of “What is it about the 90’s?”. It is an inspirationa; video of how a 90-year-old person with diabetes defies all norms. Imagine you have a great website, blogs, emailer and videos. But, your patients can’t find you on Google. The best way to solve this problem is to adopt effective methods of search engine optimisation with a detailed on-page and off-page checklist. SEO is important when it comes to digital marketing for doctors since it helps in developing a content strategy based on specific keywords used by your patients for their searches. The first task that you need to implement before developing your content is to do a keyword research using tools like Google keyword research tool and LSI Keyword generator tool. It is always ideal to choose keywords that have a lower difficulty score and higher search volume. Although you need higher search volume for better ranking of your website, quality content is always the king. As per a recent survey, 39% of patients choose their practitioner from a Google search. These statistics prove that listing your clinic or medical practice on Google My Business Listings plays a huge role in increasing your visibility and footfalls. Ensure you provide ready information with updated phone numbers, complete address, services, working hours and a link to your website. GMB listings also offer reviews shared by older patients and visitors that add credibility to your practice. Additionally, you can also feature relevant blog posts in your listings, providing viewers with a detailed glance of what you have to offer. For example, below is the GMB listing for Dr. Mohans with a link to their website, social media profiles and Wikipedia page. Digital marketing for doctors is incomplete without a strong social media marketing strategy. The most important factor that medical practitioners must keep in mind is the fact that every social media platform has a unique audience. The demographics and preferences of Facebook and Instagram are quite different than that of LinkedIn. So, it is always ideal to strategise your social media campaign based on the nature of the platform. There is no better tool than social media to address the complaints and concerns of your customers. For instance, online communities and discussion forums are great tools to handle customer complaints. Hashtag campaigns, infographics, quizzes, memes, hangout interactions and live chats are other ways to effectively engage your audience through social media. 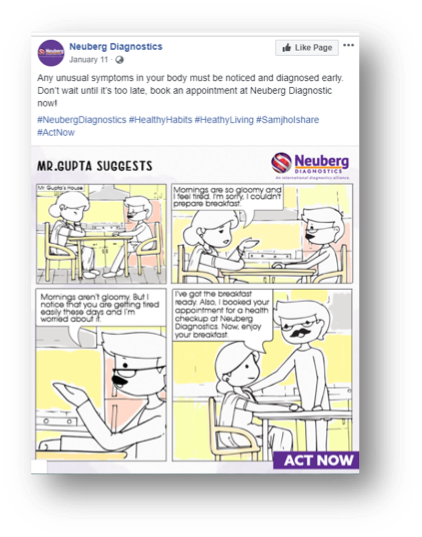 Featured below is an innovative Facebook campaign done for Neuberg Diagnostics with the hashtag #Samjhoishare. The posts play around the concept of healthy living with a comic touch, covering all the aspects of a successful social media strategy. Multilingual marketing is a great way to genuinely connect with your audience in a language they are comfortable in. By 2020, 9 out of every 10 Internet users will be consuming content in regional languages. Adopting a multilingual marketing strategy will give medical practitioners an early mover’s advantage to connect with their audience and stay ahead of their competitors. However, it is vital to take up an end-to-end multilingual strategy, from vernacular videos to regional ads, in order to create an impact and increase the credibility of your practice. 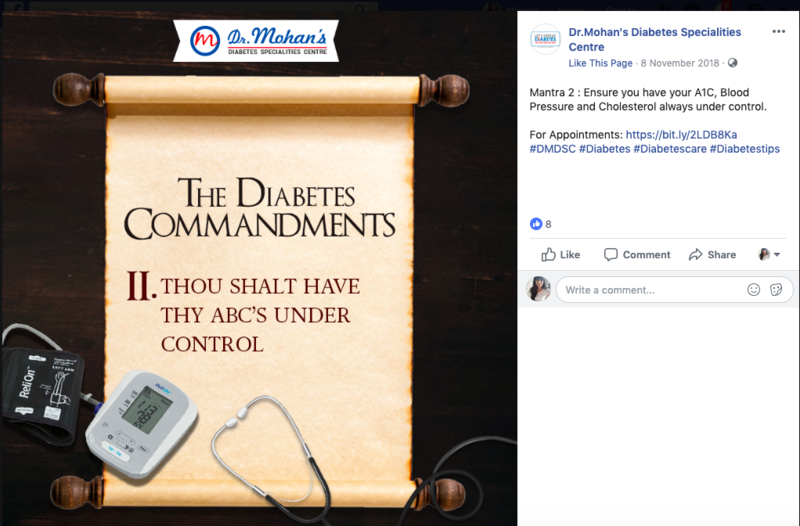 For example, featured below is a Facebook campaign on the Ten Commandments of Diabetes. 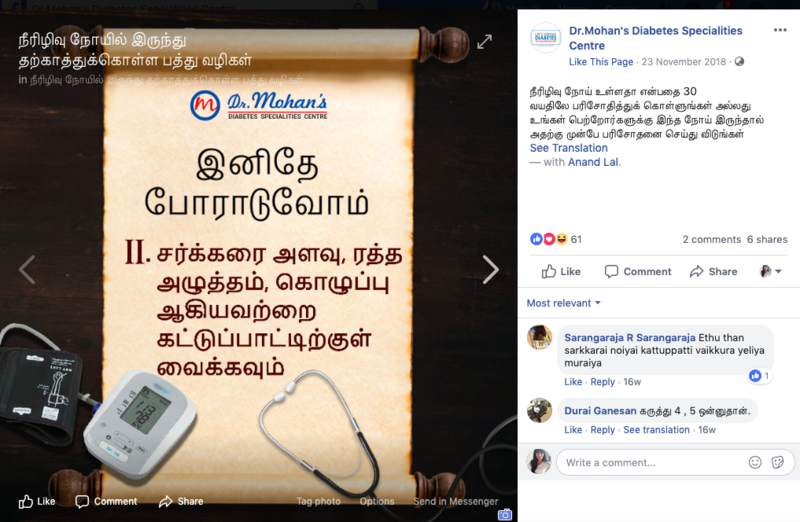 While the English posts got an engagement of 8 likes, the same campaign in Tamil generated 6 shares and 2 comments, proving to be a much effective approach to reach your target audience. While implementing an effective digital marketing strategy for doctors, it is always important to ensure that all your digital tools are streamlined and are sync with each other. Doctors must also focus on building a content management platform to track the performance of your digital assets and identify key areas that require updation and improvement. You can also check out our blog on digital marketing tips for Pharma for more insights. Thank you for your appreciation. Do check out our blog page for insight on Digital Marketing. I was surprised to learn about the 3.5 million medical searches per day. But then again, as a customer, I can totally relate to all the points you’ve mentioned. Any symptom, we immediately google about what it could be and try simple home remedies before visiting the doctor. Or even make the decision to visit the doctor after learning about it. And if it’s major, we try to find how good the doctor/hospital who treats us is. Even though word of mouth still exists, digital exposure has become a must in today’s world. Hey Steven! thank you so much for your kind words. For content on Digital Marketing do check our blog. Thank you, Parveen! You can also read our blog on Digital Marketing for Pharma for more insights. Thanks for sharing this infographic. it's very helpful for us. Amazing Information from Social Beat. Digital marketing for healthcare is quite interesting but is a challenging segment for the digital space. Hospitals and digital agencies are coming up with innovative strategies to engage with the consumers and this is a great post to highlight how doctors and small clinics can leverage it. Good post! !In this present digital age , it’s imperative that medical providers digitally market their healthcare services to provide correct medical information at all times.This approachability, through social media give the allusion of 24/7 availability and an authoritative omnipresence. Relationships flourish when you cultivate them. Over the past year there has been an explosion growth on the social networks. When you are running a Health business, big or small it is clear that you have patients, and you should be answerable to their queries they have, otherwise the competitor will be doing that and will make you stand behind. So doctors stay ahead in representing your tele brand. Good post!! Social media optimization is pretty dynamic in nature. It is economical and the audience you wish to reach can be targeted easily with the right posts on social media platforms. Its the right tool for any hospital or clinic in India.